Qazvin is a city where there are a lot of public bathhouses. We may not know any remained bathhouses in this city as sample of pre-Safavid era and except for Ghomak and Moslem bathhouses, we could not find another name in ancient texts before this period. But, the Safavid sources have referred to construction of several bathhouses in this city during this period while those foreign tourists, who visited Qazvin in this period, implied numerous and beautiful public bathhouses in this city. Today, Boloor and Qajar bathhouses have been resumed from Safavid era while both of them were repaired and reconstructed and used as museums. The Qajar Bathhouse in Qazvin Province is a national cultural heritage. Today it is an anthropology museum. But what is inside this emirate is not just a prelude to the old days of a Persian society in Qazvin; the structure of the Qajar Bathhouse itself is quite remarkable. Qajar Bath is one of the oldest and biggest public bathes in Qazvin, which was built on the order of the Safavid ruler Shah Abbas (1571-1629) by one of his commanders. 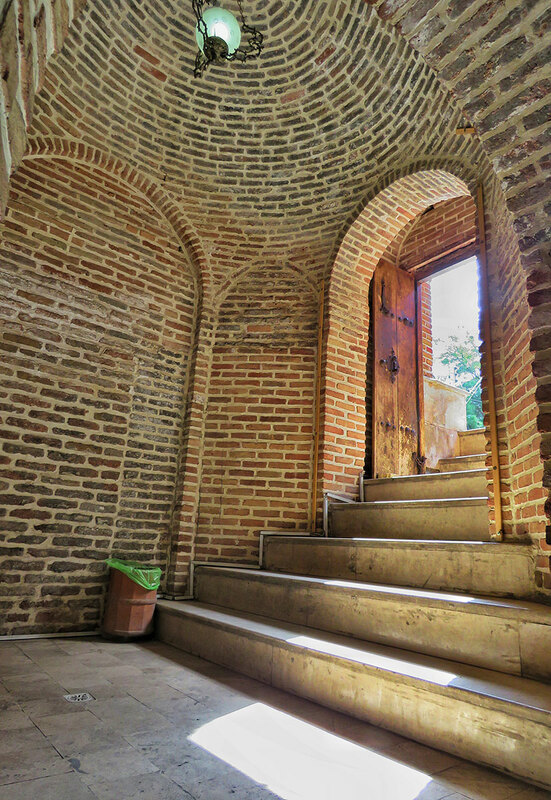 The Bath is located in a historic quarter of Qazvin. It is built primarily of brick and tile with separate domed changing areas and caldaria for men and women. The bath was in almost complete ruin when the conservation began. Since its restoration it has been converted into a museum of traditional bath culture and tea shop. Qajar bath is a monument of Safavid era. It is changing into anthropology museum now. The bathhouse includes a changing room (sarbineh) and a hot chamber (garm khaneh), and had a section for use by women and one for men. There is a big octagonal pool (howz) in the middle of the sarbineh, which has six elevated platforms where customers once sat for rest. In 2000, the Bathhouse was turned into Qazvin Anthropology Museum and now displays wax figures showing the customs, ethnicities and different vocations of Qazvin.